Dragon grappled by ISS robotic arm Canadarm2 (Credits: NASA). Running well ahead of schedule, Expedition 33 Commander Suni Williams and Flight Engineer Aki Hoshide opened the hatch to the SpaceX Dragon cargo ship at 1:40 p.m. EDT Wednesday, marking a milestone for the first commercial resupply mission to reach the International Space Station. Hatch opening had been scheduled to occur on Thursday, but the crew sped through its post-berthing procedures, enabling the earlier entrance into the cargo ship. Earlier, Hoshide, with the assistance of Williams, used the robotic arm from a workstation inside the station’s cupola to capture Dragon at 6:56 a.m. as the spacecraft flew within about 32 feet (9.8 m) of the station. 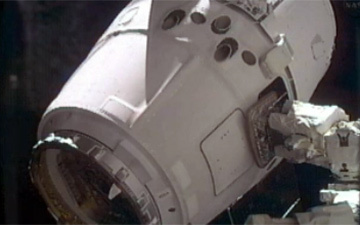 With Dragon securely in the grasp of Canadarm2, ground controllers remotely operated the arm to guide the capsule to the Earth-facing side of the Harmony module. Hoshide and Williams then swapped places at the controls of the robotics workstation, and Williams used the Canadian Space Agency-provided robotic arm to install Dragon to its docking port on Harmony at 9:03 a.m.
Dragon is scheduled to spend 18 days attached to the station. During that time, the crew will unload 882 pounds (400 kg) of crew supplies, science research and hardware from the cargo craft and reload it with 1,673 pounds (759 kg) of cargo for return to Earth. After Dragon’s mission at the station is completed, the crew will use Canadarm2 to detach Dragon from Harmony on October 28 and release it for a splashdown about six hours later in the Pacific Ocean, 250 miles off the coast of southern California. Dragon launched atop a Falcon 9 rocket at 8:35 p.m. Sunday from Cape Canaveral Air Force Station in Florida, beginning NASA’s first contracted cargo delivery flight, designated SpaceX CRS-1, to the station. The third Expedition 33 crew member, Flight Engineer Yuri Malenchenko spent his day working on experiments and maintenance in the Russian segment of the station. The cosmonaut also pre-packed a Freon leak analyzer for return to Earth aboard Dragon. Meanwhile at the Baikonur Cosmodrome in Kazakhstan, three additional Expedition 33 flight engineers — NASA astronaut Kevin Ford, and Russian cosmonauts Oleg Novitskiy and Evgeny Tarelkin – climbed aboard their Soyuz TMA-06M spacecraft Wednesday for the first of two “fit checks” in the vehicle in which they will be launched October 23 for a five-month mission on the station.